This Collapsible Grand Piano Shell available for hire for weddings, concerts and all social events. even in places that have restricted access - e.g. by a lift or narrow doorway! It is designed to accommodate an 88 note digital keyboard which is supplied with the unit. 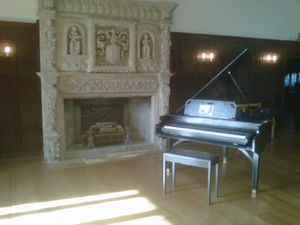 The unit can be played by any pianist or a pianist can be supplied for the event. Standard hire charge for unit with digital keyboard is £250 per day, see prices for full information. Blackstock Barn Hellingly, Bannatynes Hotel Hastings, The Birch Hotel Haywards Heath, Chapter 12 Wine Bar Hailsham and several other venues in London and the South East. 2014 Saw the Semigrand at the BBC Good Food show with Vanessa Hastings,with the UK tour of "Only Men Aloud", at the Jewel Bar in Piccadilly Circus, London, Hendall Manor Barns (near Uckfield, East Sussex), Little Horsted Place, near Uckfield. 2015 was another great year for the Semigrand. The piano went to Warners in West Sussex at Sinah Warren for a cabaret featuring the 'Sing Out Sisters', an Indian wedding in Wembley with Ajay Shar, many WI meetings for sessions featuring the Great American Songbook. In August a Semigrand appeared on the Watch TV channel for an edition of 'Singing in the rainforest' with Myleene Klass. 2017 Two more Semigrands (for touring around Europe) sold to the London nightclub. Hailsham Town Fair gig with Peter Willson in July and our first order for an upright piano to be delivered early in 2018. So far 19 Semigrands have been built. This collapsible grand piano shell is supplied for hire with a full sized (88 note) digital keyboard and amplifier (if required). The unit is built to exactly resemble a 150cm size (baby) grand piano but is light enough for one person to carry to site and to assemble. The hire price includes erection before the event and the breakdown and removal afterwards. *The unit has a very solid feel when erected, withstands energetic performances!